James Patterson, one-time advertising copywriter and now one of the world’s most prolific and successful storytellers, has yet another massive bestseller on his hands with Cross My Heart, the twenty-first book in the hugely popular Alex Cross series. The hero, a brilliant Washington DC detective and forensic psychologist, consistently tops the list of the world’s favourite crime fighters. This is a relentless page-turner; the first installment in a two-part story with a breathtaking cliffhanger ending. While the format hasn’t been universally well received by fans, we’re promised the wait won’t be too long and we’ll have the end of the story in 2014. For Detective Alex Cross, nothing’s more important than family. When a dangerous and obsessive enemy uses this against him, his wife, grandmother and children are placed in mortal danger. If Cross even tries to save them, they’ll be killed. 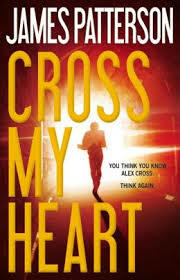 In Cross My Heart, Alex faces the toughest and most unsettling challenge of his personal and professional life. Can he get inside the mind of a criminal madman, save his family and ensure that justice is done? According to Forbes, James Patterson was the world’s best-selling author in 2012, earning an astonishing $94 million – that’s more than Stephen King, John Grisham, Stephenie Meyer and J K Rowling combined. He’s also perhaps unusual in that most of his fortune comes from book sales, rather than TV and movie rights. That said, we have three great Alex Cross movies, Kiss The Girls (1997) and Along Came a Spider (2001), both starring Morgan Freeman, then Alex Cross (2012) with Tyler Perry. For Patterson’s many millions of fans, the ending of this novel may come as a surprise, but otherwise, it’s a gripping read. Set aside a couple of days, get comfortable and unplug the phone – you won’t be able to put this one down.